Got questions? Discuss this lesson HERE. Hey hey, UUers! The Holidays are upon us! December is only a couple of days away, and instead of waiting for the 1st of the month to release the newest episode of Uke Lessons, we were so excited about this wintertime song that we decided to release December's lesson - today! So without further ado ... Uke Lesson 12 - "Let It Snow"! Lately the forum has been buzzing with questions, chords & tabs, videos, and original compositions about the holiday season, so we're more than happy to add to the flurry. We've put together a special play-along version of "Let It Snow" where you can jam the entire song right along with Aldrine! Check out the video here. 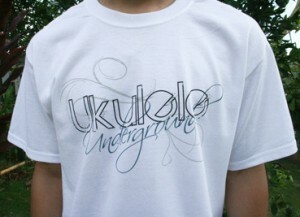 *Also* Just in time for the season, our shipment of Hooded sweaters has arrived along with the brand NEW Ukulele Underground UUth T-Shirt! Get some of your uke-related holiday shopping done today, so you can have more time to work on all your favorite winter tunes. Would love to learn some more Christmas music if anyone has music to share. Since the playalong is no longer there, can someone put the chord progression up here? I found some on tab sites that come close to using the same chords, but it’s not exact. Thanks! umm yeah i know how to strum an all but how do i do the stumming the nots patter like do i do f then c then f then c then ab diminsihes but that sound wrong idk can u tell me?